Adaptive Learning Methods for Nonlinear System Modeling presents some of the recent advances on adaptive algorithms and machine learning methods designed for nonlinear system modeling and identification. Real-life problems always entail a certain degree of nonlinearity, which makes linear models a non-optimal choice. 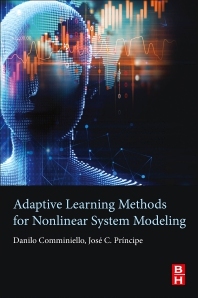 This book mainly focuses on those methodologies for nonlinear modeling that involve any adaptive learning approaches to process data coming from an unknown nonlinear system. By learning from available data, such methods aim at estimating the nonlinearity introduced by the unknown system. In particular, the methods presented in this book are based on online learning approaches, which process the data example-by-example and allow to model even complex nonlinearities, e.g., showing time-varying and dynamic behaviors. Possible fields of applications of such algorithms includes distributed sensor networks, wireless communications, channel identification, predictive maintenance, wind prediction, network security, vehicular networks, active noise control, information forensics and security, tracking control in mobile robots, power systems, and nonlinear modeling in big data, among many others. This book serves as a crucial resource for researchers, PhD and post-graduate students working in the areas of machine learning, signal processing, adaptive filtering, nonlinear control, system identification, cooperative systems, computational intelligence. This book may be also of interest to the industry market and practitioners working with a wide variety of nonlinear systems. Presents the key trends and future perspectives in the field of nonlinear signal processing and adaptive learning. Introduces novel solutions and improvements over the state-of-the-art methods in the very exciting area of online and adaptive nonlinear identification. Helps readers understand important methods that are effective in nonlinear system modelling, suggesting the right methodology to address particular issues. Danilo Comminiello is a Tenure-Track Assistant Professor with the Department of Information Engineering, Electronics and Telecommunications (DIET) at Sapienza University of Rome, Italy, where he teaches Machine Learning for Signal Processing. His current research interests include computational intelligence and machine learning theory, particularly focused on audio and acoustic applications. Danilo Comminiello is a Senior Member of “Institute of Electrical and Electronics Engineers” (IEEE), and Member of “Audio Engineering Society” (AES) and “European Association for Signal Processing” (EURASIP). He is also a member of the “Task Force on Computational Audio Processing” of the IEEE “Intelligent System Applications” Technical Committee (IEEE Computational Intelligence Society). Jose C. Principe is a Distinguished Professor of Electrical and Computer Engineering and Biomedical Engineering at the University of Florida where he teaches advanced signal processing, machine learning and artificial neural networks (ANNs) modeling. He is BellSouth Professor and the Founding Director of the University of Florida Computational NeuroEngineering Laboratory (CNEL). His primary research interests are in advanced signal processing with information theoretic criteria (entropy and mutual information) and adaptive models in reproducing kernel Hilbert spaces (RKHS), and the application of these advanced algorithms to Brain Machine Interfaces (BMI). Dr. Principe is a Fellow of the IEEE, ABME, and AIBME. He is the past Editor in Chief of the IEEE Transactions on Biomedical Engineering, past Chair of the Technical Committee on Neural Networks of the IEEE Signal Processing Society, and Past-President of the International Neural Network Society. He received the IEEE EMBS Career Award, and the IEEE Neural Network Pioneer Award. He has more than 600 publications and 30 patents (awarded or filed).